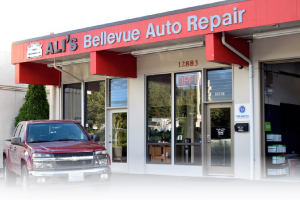 Ali's Bellevue Auto Repair, along with Ali's Woodinville Auto Repair, is family-owned and operated auto repair facilities. With 30 years of experience, Owner Alirio Valencia runs his auto shops with integrity and a commitment to providing fast, friendly, and efficient service to all his customers. Ali's Bellevue Auto Repair customers find that this kind of approach to Auto Service creates great value. Ali, his family, and the rest of his staff want your next auto repair or service to be with them, and they want you as a customer for life! lifetime customer! Our Auto Repair Shop focuses on keeping a highly-trained staff. We pride ourselves on combining our advanced training with our state-of-the-art diagnostic tools to get the most accurate diagnosis possible. This accuracy in diagnosing the issue can save you time and money, and it's what allows us to make the right fix and get you back on the road faster than any other Bellevue auto mechanic! Ali's Bellevue Auto Repair, like it's sister shop Ali's Woodinville Auto Repair, offers the most auto services and expertise of any area auto shop. Many auto repair places must send your transmission elsewhere to be repaired, and most do not handle auto body repair at all. And of course like we mentioned above, our diagnostic tools are as up-to-date and extensive as any auto repair Bellevue, or any Eastside shop has to offer. This makes us more clear and efficient when it comes to your engine repairs, engine rebuilds, and engine replacements. We also want all Bellevue drivers' muffler repairs, brake repairs, oil changes, and wheel alignments!